Our proprietary IMPACT engine emulates the microdynamic movements of real speakers, adding a sense of realism not commonly found in amp modelers. The included assortment of brutal amps can be paired with the included cabinet collection, allowing you to hone your perfect tone quickly! 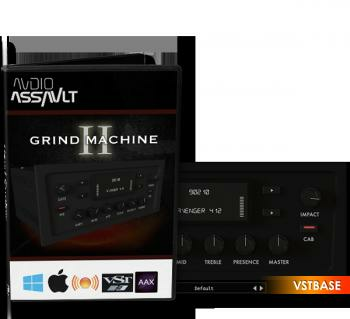 Grind Machine II’s streamlined GUI places all controls at your fingertips in one screen. This keeps you focused on dialing in the right tone, and helps you avoid getting lost in a sea of options. The intuitive layout mimics the familiar workflow of most guitar amps, making Grind Machine II easy to use right out of the box. The input section features a noise gate and preamp bypass section. The included Gate has a default threshold of -150dbfs, but can reach as high as 0dbfs to suit all your creative gating needs. The PRE switch bypasses the preamp section, allowing use of Grind Machine II’s Cab section. This allows you to use Grind Machine as an IR loader, allowing you to take advantage of our proprietary Impact Engine with any amp sim you wish to use! The TIGHT switch turns on a booster circuit, tightening the low end and smoothing the high gain. Grind Machine II provides a wide variety of high gain amp flavors! 90210 emulates the legendary american high gain of choice. Acutronix is an original designed clean preamp tone which compresses naturally at higher gain settings while still retaining a clean tone. Ak-45 is an original design high gain preamp tone that can drive you down the Rocky Mountain Way straight to the Highway To Hell! Bassmaster is based on a legendary bass amp adopted by guitarists in the 60’s. This same amp inspired Jim Marshall’s JTM45 amp. BRT 880 is based on an amp that can be considered nothing short of Rock Royalty. Butterton is an original design high gain preamp that delivers a buttery midrange that’s perfect for filling out a mix! Demoniac emulates the great german high octane amp. Lil Monster is the byproduct of an alchemist and a mad scientist competing in a battle to the death. PVGL Fire is an inspired hybrid of German and American high gain legends! Raptor is based on the single tube amp that reformed our expectations of what rock guitar should be! The Knife is an original design high gain preamp with a tone that can cut like a knife…or a machete! The Sonic is inspired by a popular German amplifier known for its high headroom that keeps the mud away! Triceratop is based on the triple pronged monster from the same line as the Raptor. UV35 is based on another German legend popular for its face melting tones! Grind Machine II comes loaded with 15 custom cabinet IR’s in its expandable IR section! Cabs loaded into Grind Machine II can benefit from our proprietary Impact control, which emulates the microdynamic response of a speaker! “Impact” controls the amount of speaker movement being emulated. Zero provides no movement modeling, while 100% emulates the dynamic movement of an extremely loud speaker. Cab switch bypasses the cab loader and Impact section completely, allowing you to use any IR loader you wish with Grind Machine II’s preamps! Grind Machine II’s on board controls provide a familiar workflow for effortless use. Each parameter can be automated, allowing for customization and flexibility!